Robert Barker has been described as a great benefactor to the village of Datchet. However, the charity which bears his name, the Barker Bridge House Trust, did not originate with him and only acquired his name when he regularised the charity, as the last surviving trustee, just before his death. For more information about that see the History of the Royal Stag pages on the old website. In 1578 Christopher Barker, Robert’s father, acquired the title ‘Printer to Her Majesty the Queen’, paying for the privilege which we would call a monopoly, and his son Robert inherited it in 1600. Such titles were bought and sold, inherited and quarrelled over as lucrative trading restrictions; what was at stake was money and power rather than philanthropy or royal goodwill. Robert Barker’s greatest achievement was the printing of the King James Bible in 1611, which he claimed to have funded himself to the sum of £3000. 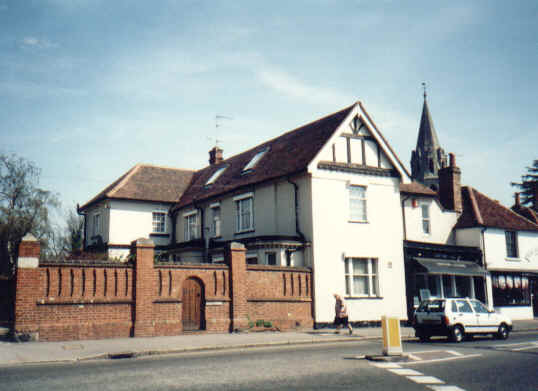 From the 1580s Christopher and Robert acquired huge amounts of property in Datchet, contributing to Robert’s final disgrace by over-reaching of resources. This is the story of colourful characters with great talent who did nothing by halves. Christopher came from Marr near Doncaster to London and became a Freeman of the rich and powerful Draper’s Company, one of the City of London Guilds. 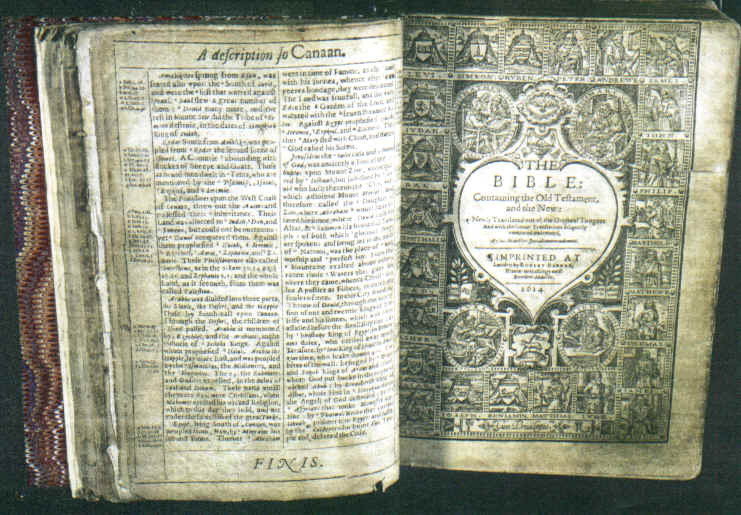 The Drapers were involved, as financial backers, in promoting Puritan religious ideas and were very anxious to have English bibles freely available. He moved to the Stationers’ Company, as did many other Drapers, and seems to have been a bookseller in 1569. By 1578 he had acquired the patent, from its previous holders, to print the Queen’s books in Latin, Hebrew and Greek, all Bibles, the Book of Common Prayer, Statutes of the Realm and Royal Proclamations. This form of copyright had existed from the time of Henry VIII, but at first only applying to statutes and proclamations. By 1583 Christopher owned five printing presses and was based at St Paul’s Churchyard in the City of London, but we would probably describe him as the publisher rather than the printer; he put up the money, ran the business and fought off all challenges to his monopolies. He is unlikely to have set up type or worked the presses himself, but could have been responsible for what we would call the design of the print, decorations and bindings. The office also gave him full access to the master printers who had become a new craft elite and allowed him to take on more apprentices than anyone else. In Tudor times many newly-rich London merchants bought country estates at convenient distances from the City, since real status still depended on possession of land. Datchet was both an easy day’s ride from London and close to the royal court at Windsor. In 1583 Christopher Barker bought the estate of Southlea which is now represented by Southlea Farm. 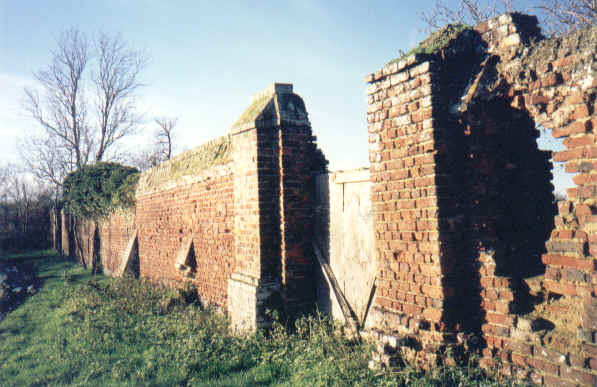 All that remains of the Barkers’ Old Southlea House, which had probably been rebuilt before it burnt down in 1900, is ruined 18th century garden walls and gateways. At his father’s death, Robert already held a partnership in the royal printing presses and in 1600 the Stationers Company recognised his right to his father’s office of Royal Printer. (Christopher would have paid a large sum for this privilege to pass the title on, and Robert similarly bought the right to pass it on to his eldest son.) Almost immediately, Robert found his monopoly being challenged by Bonham Norton, another very rich Stationer, who had sent printers over to Holland to print bibles there. Norton was an extremely vexatious character, but he and Barker became close enough friends for Robert’s eldest son Christopher to marry Sarah, Norton’s daughter, in 1615. This marriage would have been a deliberate move to consolidate their interests and fortunes rather than a chance love-match between their children. By the time of his first wife Rachell’s death in 1607 she had produced twelve children, of whom eleven survived, but in 1609 the first of seven more children was born to his second wife Ann. Robert Barker’s profligate use of his great wealth is demonstrated by his acquisition of the Rectory of Datchet and its tithes, as a middleman to St George’s Chapel in Windsor. (For details of the Rectory, now Old Priory, see the pages on this site.) In 1598 he was prepared to pay not only the entry charge of of £500 but also £700 owing from the previous lessee, which was a very unusual action to take. And in a gesture of grandeur at the Stationers’ Company, he paid a fine in order to avoid taking on an official role which would have been irksome to him. Robert’s greatest venture was the printing of the new translation of the bible ordered by James I and begun in 1605 at Hampton Court Palace. The translation was made by several different committees of scholars who met to check each others’ work and to read the texts out loud, as they would be when in use. In 1610 the manuscript was finally handed over to Robert Barker, who is said to have paid £3,500 for it. It seems that the project was jointly funded with Bonham Norton and work certainly proceeded very quickly as the first edition is dated 1611. From 1618 a bitter and protracted series of lawsuits ensued between Barker and Norton and their varying business partners. Norton seems to have held shares in the royal printing business, and trouble broke out over the shares also owned by Robert’s son Christopher, who was in financial difficulties. Books and bibles printed between 1617 and 1629 carried a bewildering series of printers’ names; sometimes Barker with a partner, sometimes Norton with the same partner – or a different one ! It was difficult to tell who actually was ‘The King’s Printer’ until Robert Barker was confirmed in the office in 1629. However, Norton accused the Lord Keeper of taking a bribe (which sounds at least possible ! ), was fined and imprisoned, dying in prison in 1635. There had frequently been ‘pirate’ editions of bibles and all other books, often printed on the continent. In 1631 Robert Barker and his associate Martin Lucas went off the Bristol to impound sixty bibles being illegally imported through Bristol – but Barker went on to sell the confiscated books ! Compared with modern printing, books of this time often contained careless mistakes, not surprising when one considers the huge volume of trade a partnership dealt with, and all the other calls upon their time and attention. The worst mistake of all, so gross that it suggests sabotage rather than a careless slip, occurred in 1631. The word ‘not’ was omitted from the seventh commandment, so that it read ‘Thou shalt commit adultery’. The whole imprint was recalled and Barker and Lucas were fined £300, though it seems this was never paid. As an alternative to paying, Barker was to supply a Greek letter font to the University printers at Oxford and Cambridge, but again it is not known if this was ever done. He certainly was under financial difficulties at this time, since he sold the Southlea estate, previously mortgaged to Bonham Norton, to Richard Berringer of Iver in 1631. In this same disastrous year Robert’s second wife, Ann, also died. Matters soon grew even worse. 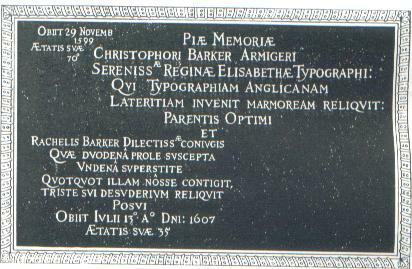 In 1635 Robert’s son and partner Christopher died, as also did his son Charles and his wife Elizabeth, who was buried in Datchet on the same day as Christopher. And in 1635 Robert mortgaged his share in the office of Royal Printer to the unrelated Miles Fletcher and was himself committed as a debtor to the King’s Bench Prison. The only further known mention of him before he died in prison in 1645 is the deed of 1644 by which he established a further group of trustees to continue running the Bridge House for the upkeep of the bridge in the centre of Datchet (see the History of the Royal Stag). It seems that Robert’s family actually lived in the Rectory House, since in 1626 it was leased to Tobias Wood, who had married Robert’s eldest daughter Elizabeth. In 1638 it was again leased to three heirs or assigns of Barkers’ daughters. It is possible that Robert may have lived there himself.The same Richard Berringer who bought the Southlea estate also eventually owned the Rectory from 1662.Almost nothing now remains of the original house as it has been rebuilt by at least one rich lay Rector, and more recently remodelled by Mr Nelson Masters. During 1640 Robert’s grandson Christopher (son of Christopher) became established as a printer in London, and Robert’s daughter Agatha had married a printer named John Legate. During the Civil War, in 1639, Charles I sent for his printer and presses to join him in Berwick to where he had marched with an army against the Scots. As he was in prison Robert could not go, but John Legate went in his stead and printed several proclamations which were inscribed, ‘Imprinted at Newcastle by Robert Barker, Printer to the King’s Most Excellent Majesty’. Robert’s grandson Christopher also followed the King’s summons to the north, carrying presses to York and printing documents there bearing Robert’s name. In 1651, during the period of Cromwell’s Commonwealth, Robert’s fifth son Matthew tried to retrieve the family’s office of Royal printer, but was refused as he was a lawyer and not a member of the Stationer’s Company. At the Restoration of Charles II Christopher Barker successfully regained the title with his partner John Bill, continuing to print bibles until 1680. But matters were not at an end; Roger Norton, son of Bonham, brought an action against Christopher, claiming that his father had owned a share in the manuscript of the King James’ Bible. Christopher was fined damages and costs, but the manuscript never did reappear. If it was passed to the Norton’s it would probably have perished in the great fire of London, but the London printers, as late as 1701, claimed that the Barkers had deliberately hidden it. As there is some suggestion that the manuscript was in Datchet during the time Robert Barker was working from it, one might speculate that it was hidden (and lost) somewhere in the village ….